Huge Savings Item! Free Shipping Included! 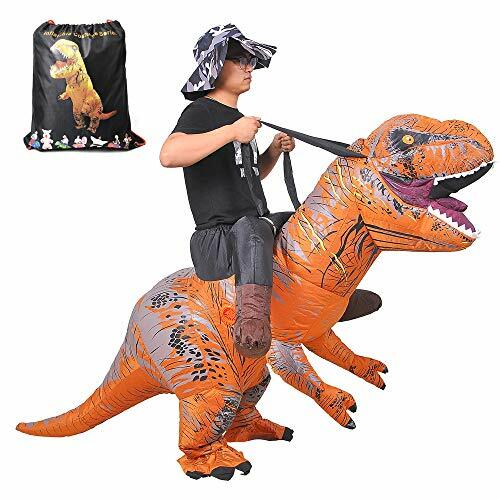 Save 15% on the RHYTHMARTS Riding Dinosaur Costume Adult Inflatable Costume Kids with Drawstring Bag by RHYTHMARTS at Luxury Bags Sale Store. Hurry! Limited time offer. Offer valid only while supplies last. 【Cretaceous Costume】 - Suit up and get scary-silly in this Inflatable Dinosaur Costume. Modeled after the king of prehistoric beasts, the air-filled garment turns you into every child's dream: a walking, talking T- Rex. 【Ferociously Funny】 - The contrast between frightful lizard and limber movement creates a sense of prehistoric playfulness that easily amuses everyone. 【High Fashion】 - It's been said that everyone needs a tuxedo, but in today's world, you'll probably get more use out of a T-rex suit than a dinner jacket. 【Dinosaurs Ruled the Earth】 - When you climb inside your Inflatable Dinosaur Costume that please ruled the Earth. 【Size】 - This size suit for 4.0 ft-6.2 ft / 1.2 m-1.9 m person, one size fits all Unisex Adults. If you have any questions about this product by RHYTHMARTS, contact us by completing and submitting the form below. If you are looking for a specif part number, please include it with your message.